Felines, dogs, and bears liven up these projects from designer Jan Kornfeind. Each fiesty feline on the wall hanging has three-dimensional ears, button eyes and a real bell. The Dandy Dogs have knotted bows and fun, floppy ears. The bears have stand-up ears and busy bee buttons. Each of these three wall hangings has one or two companion pillows for a total of seven projects. 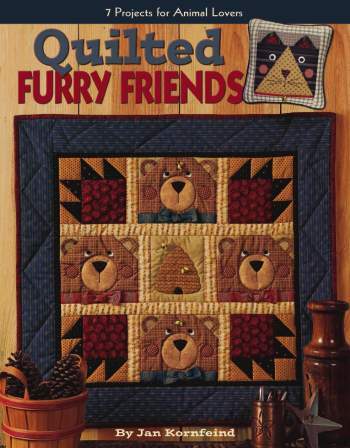 Machine applique makes the charming characters fast to finish, so you'll have some furry friends in no time! 40-page soft-cover stapled booklet.